Building on over 20 years of broadcasting as a BBC radio producer, Richard continues to pursue his interest in audio through recordings of the natural environment as well as the spoken word through oral history. As a sound artist, Richard experiments with natural sounds and with found sound to create new soundscapes and audio installations. Richard also produces short films. Richard is a consultant for the Open University and the University of Dundee Sounding Coastal Change project. The research project is focussing on environmental and social change in North Norfolk and is exploring this through sound. Richard has held workshops for the team and local school and has produced a short audio installation for St. Nicholas’ Church in Blakeney. 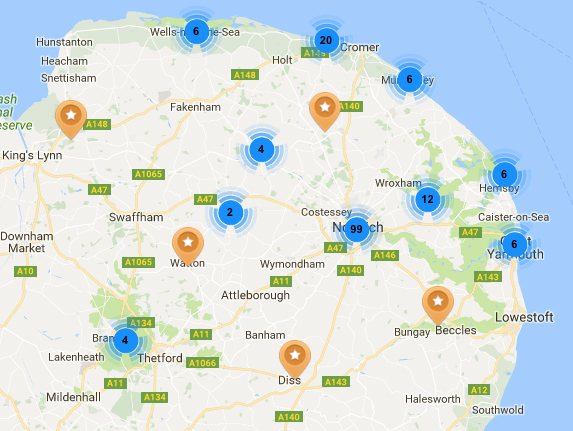 The Norfolk Sound Map is a collection of Richard’s field recordings, features and interviews exploring the diverse sounds of this East Anglian county and observing how they are changing. Examples include the dawn chorus at Ranworth Broad and the clock mechanism at City Hall in Norwich. You can hear the revving engines of a group of local scooter enthusiasts gathering on Magdalen Street for a charity ride, or chill to the sound of rain falling softly on the trees at Thetford Forest. There are around 150 recordings, with more sounds added regularly. Richard also produced a short series based on the Norfolk Sound Map for Future Radio in Norwich. Richard has led sound recording workshops for both public and corporate events. The sessions involved practical exercises for members of the public at a workshop at the Norfolk Wildlife Trust Reserve at Cley. He ran a special session for staff at the Norfolk Rivers Trust (NRT) as part of their current project involving eels. Richard continues to offer advice to the NRT on best practice in collecting audio data and oral history. As part of the Norfolk Wildlife Trust’s 90th Anniversary celebrations, Richard collaborated with landscape photographer Richard Osbourne to produce a series of shop window installations featuring photographs and audio from a number of the Norfolk Wildlife Trust Reserves. Richard produced a film looking at the role of Norfolk men during the Battle of the Somme during World War 1. He is currently producing a second film focussing on the Battle of Gaza. Richard composed the music scores for both films.